Wings Hinterland Retreat, AMAZING Panoramic Views over Gold Coast! 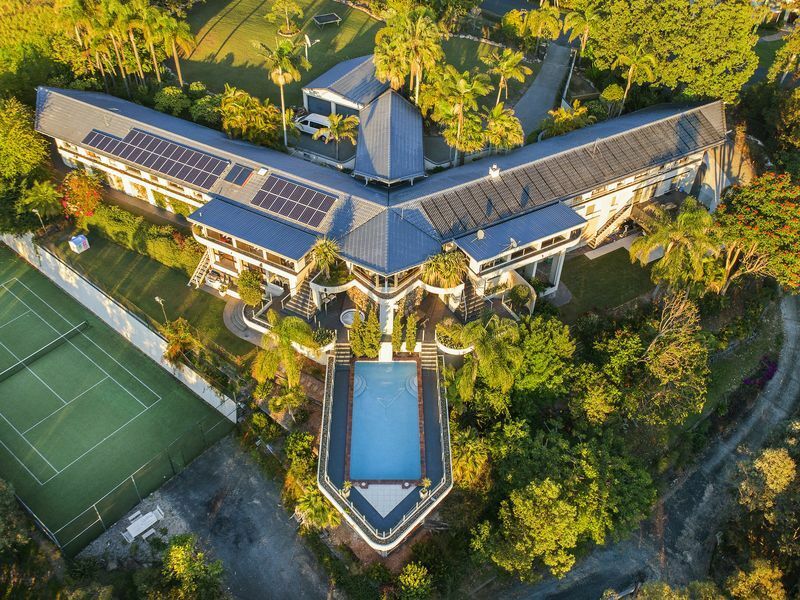 Wings Hinterland Retreat is on 10 Acres with 1500 Square meters of living room comprised of two "wings" to maximise the breathtaking view of the Gold Coast and the Hinterland. This house is HUGE by anyone’s standard. This is THE largest, most amazing property with privacy and panoramic views of the Hinterland and Gold Coast skyline from EVERY room! Whether you’re in the 14 person cedar sauna, relaxing in the spa, having a hit on the full size tennis court or simply taking a dip in the massive cantilevered swimming pool this house is luxurious and comfortable offering you stunning views from every aspect. Used as the "Hideout Mansion " in the Filming of the TV series "Mission Impossible"
IF YOU WOULD LIKE A FREE QUOTE, HAVE A QUESTION OR WISH TO BOOK A VIEWING SCROLL DOWN PAST GUEST REVIEWS AND SEND US A MESSAGE. In accordance with Gold Coast City Council and Holiday Rental Group Code of Conduct, this house has a strict NO Large PARTIES and NO Large FUNCTIONS policy. As this property is situated in a rural residential suburb, in consideration to our neighbours we request all guests keep noise to a minimum outside and observe the residential area 'quiet time' From 10pm to 8 am. Bedroom 3 on our floor plan shows a king size bed & a bunk bed. The bunk bed is not currently set up. If you require an extra bed please request this and we can split the king into two king single beds. Please note the roman bath in bedroom 3 has been disconnected due to the property being on rain water. We do have a normal size bath in bedroom 5 and an outdoor Jacuzzi for you to enjoy. We are sorry for any inconvenience. Outside only please. Must pick up butts. We stayed at wings hinterland to celebrate a birthday. This place has absolutely everything. We didnt want to leave at the end of the weekend. You could never get tired of the view over the gold coast. We would stay here again in a heartbeat, couldn't fault it. Thankyou for your 5 star review! We are glad you and your guest loved the property and had an incredible time. Hope to see you again one day soon! Surfers Paradise or Mount Tamborine. The grocery shops are 5 minutes away. The house was immaculate, very clean with everything you would need provided. Loved the games, books, billiards table, tennis courts and the pool filled with inflatables that would keep the kids busy all day. There was a spectacular view of the Gold Coast city skyline from any location in the house. Sandy and Blair were so wonderful to communicate with and made it so much more enjoyable. The property was outstanding for our group of 22 close friends & family of 12 adults and 10 kids under 12. The most spectacular views of the entire Gold Coast. There was so much living space and variety of 'hang-out' options within the house that you could feel like you were having a different experience on each day or night. If you wanted privacy you could have it, but also have everyone together for meals and drinks. The kids absolutely loved it....they rated it as the best place ever for hide and seek!....As much as we love our kids we barely saw them over the 3 days as they kep themselves busy with fun in the space. Our family of 26 celebrated a family birthday at Wings. We had family come from overseas and interstate, so being close the Cooloongatta airport and Brisbane made it easy. The views from the house are superb. The property offered something for all ages - some played tennis or pool while others relaxed admiring the beautiful view or had a spa/sauna. The pool table and bar area was used all through the weekend, with all the family playing many games of Kelly pool!! The bedrooms are all beautifully made up, and the downstairs 'bunk room' was the perfect location for our group of teenagers / young adults. The kitchen is very well equipped and has great facilities. It was very easy to cater for 26 and a birthday dinner. Sandy, the host, was exceptionally helpful. We were able to contact her to provide firewood, and she was more than happy to help with anything during the weekend. The house is close enough to shops to duck out for supplies. We had a very special family time at Wings, and Would thoroughly recommend for any family gathering. Our time there was too short! Our extended family - 17 adults, 3 children, 2 babies and 2 spoilt dogs spent a magic few days at this gorgeous home to celebrate two special birthdays. We had the most amazing time with plenty of things to do for every age group. The vast space in this property ensured that if you wanted a break from the activities you could slip away and enjoy some quiet time. The views are nothing short of breathtaking and the abundant wildlife an absolute joy. We saw wallabies on the property and wedgetail eagles soaring in the valley below and the owner assured us their are koalas in the area. Sandy, the owner could not have been more helpful both in the lead up to our stay and during the time. Picture sitting in the pool or spa with the whole Gold Coast vista stretched out in front of you. The tennis court was in good condition and certainly got a workout during our stay.